New varieties of these once-scrubby shrubs are still drought-tolerant and low-maintenance, but now also colorful and interesting year-round. WEIGELA IS A hardy, drought-tolerant, low-maintenance shrub famous for prolific displays of tubular, inch-long flowers in spring. Despite the fact that the blossoms on these members of the honeysuckle family are magnets for hummingbirds, Weigelas went out of favor because the coarse green leaves and stiff, rangy shape of the standard varieties were less than inspiring when not in bloom. Over the past 10 years, however, Weigelas have made quite a comeback in Northwest gardens, thanks to the introduction of interesting new varieties with colored foliage that look great even when they aren’t blooming. If you have room for a shrub that can reach about 6 feet tall, Wine & Roses Weigela (Weigela florida ‘Alexandra’) is a standout, featuring glossy, dark wine-red leaves that remain purple all summer. In spring, it produces masses of rosy-pink flowers that contrast beautifully with the dark foliage, and it reblooms intermittently in summer and fall. If you want to add a blast of golden sunshine to your garden, give Weigela ‘Looymansii Aurea’ a try. The leaves emerge brilliant bright-yellow before fading to soft yellow with a red rim during the summer. The flowers that occur in spring and sporadically in summer are pastel pink brushed with purple. ‘Looymansii Aurea’ will burn in hot summer-afternoon sun, so is a good choice for bright shade or morning sunshine. There are two very showy variegated Weigelas available at local nurseries. Weigela florida ‘Gold Rush’ sports very bright, lime-green leaves edged in yellow, and has light-pink flowers that age to rose. The foliage on Weigela florida ‘Variegata’ is yellow, white and green, and the tubular flowers are rosy-red. The leaves on these variegated varieties color up best in full sun. 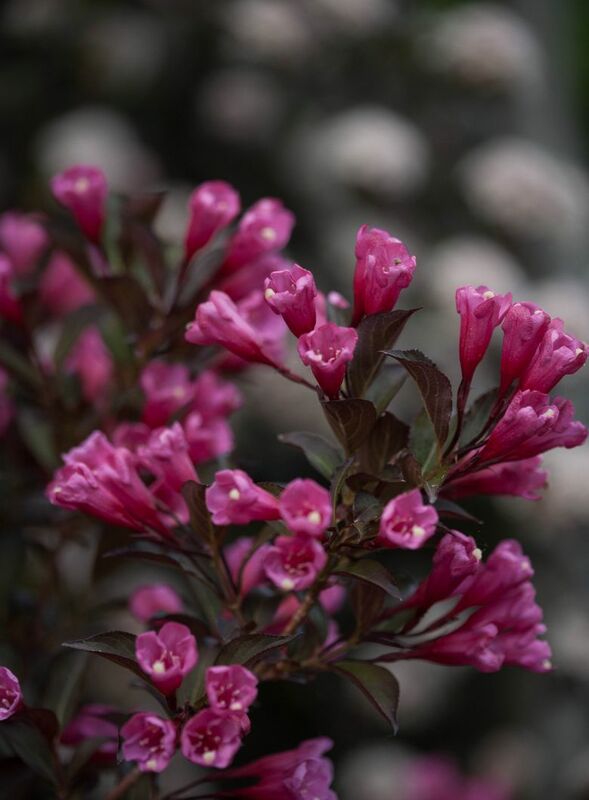 More recently, Weigela breeders have gone a step further with the introduction of new colorful dwarf Weigelas, perfectly suited for the front of the border or small gardens. 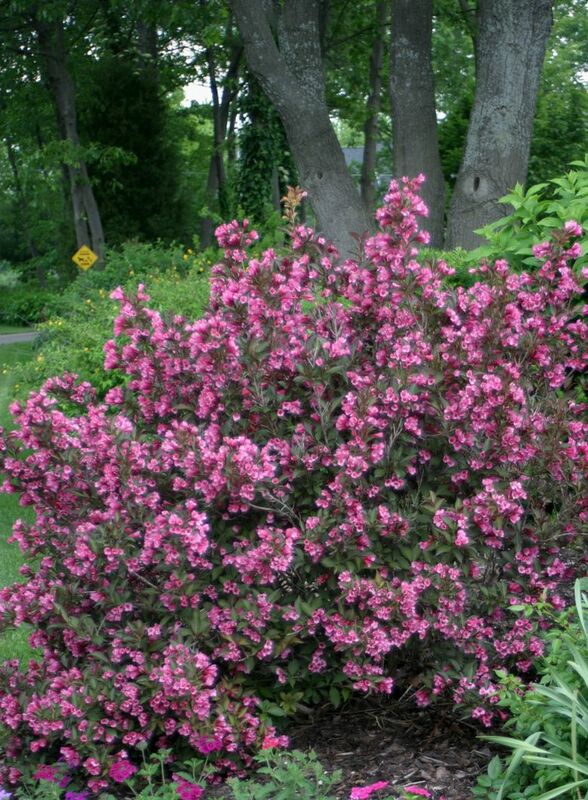 Fine Wine Weigela grows to only about 3 feet tall. It has smaller leaves than Wine & Roses but produces an abundance of pink spring flowers. Even more compact is Weigela florida ‘Midnight Wine’. This munchkin has similar deep-burgundy leaves and vivid pink flowers, but grows only 10 inches tall by 20 inches wide. Perhaps the most exotic of them all is Minor Black (Weigela florida ‘Verweig 3’). Located in full sun, the leaves on Minor Black Weigela are very dark purple, almost black, and gradually mature to a rich, coppery golden red. It has a compact growth habit, and stays smaller than most other purple-colored Weigela varieties, topping out at 2 feet tall and wide. When the rosy-pink flowers appear in spring, the combination of flowers and leaves is spectacular. A beautiful dwarf with variegated leaves is Weigela florida ‘My Monet’. This one sports cream, pink and green leaves and attractive purple-pink flowers on a 10-inch-tall-by-16-inch-wide plant. To entice a second bloom on these dwarf Weigelas, trim blooming branches back lightly, immediately after the spring flowers fade. All the dwarf Weigelas color up best in full sun. These shrubs require little pruning. All that’s needed to keep them floriferous and attractive is to remove twiggy stems and weak or crowded shoots immediately after flowering. On mature plants, if flowering decreases, cut back the stems that bloomed to side shoots and didn’t produce blossoms right after the spring flush of flowers fades. Pruning off expired flowers in spring also stimulates more profuse rebloom later in the season. Perhaps the best thing about these new Weigelas is that with their colorful foliage, they make great thorn-free replacements for barberries. It’s nice to know you can back into one while you’re out weeding on your hands and knees without it being an uplifting experience!